Student attendance at Chicago Public Schools dropped significantly Thursday during "A Day Without Immigrants." CHICAGO — Workers around the city stayed home from work Thursday, and dozens of businesses shuttered, as part of the nationwide "A Day Without Immigrants." Schools in Chicago also saw a big attendance drop. Attendance at Chicago Public Schools dropped to 85 percent Thursday, when attendance on the same Thursday in 2016 was 94 percent, the district said. More than 381,000 students attend CPS schools, meaning that more than 50,000 kids stayed home, nearly 30,000 more than the same day last year. Among schools with predominantly Hispanic populations, attendance was even lower, at 76 percent. Thursday also saw protests in Chicago against President Donald Trump's immigration policies. Attendance among Hispanic students on Tuesday and Wednesday was 95 and 94 percent, respectively, making Thursday's drop stand out. More than 100 CPS schools had attendance drop more than 20 percent Thursday compared to one year ago, the district said. At Reilly Elementary, where 94 percent of students are Hispanic, one teacher said half his students were absent Thursday. In other classrooms at the Avondale school at 3650 W. School St., five to 10 students per class were missing, he said. 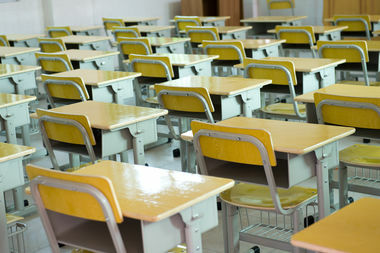 The average class size is about 25 students. "Students have told me that their fellow classmates are not here because their parents are fearful 'la migra' — or Immigration [agents] — might come to their home today," said the teacher, who requested anonymity because he was not authorized to discuss attendance matters. Reilly's administration declined comment and referred DNAinfo to district officials. "We know that many members of our school community are deeply concerned about recent federal activity, and we want our families to know that we will do everything legally possible to prevent [U.S. Immigration and Customs Enforcement] from accessing our schools," said Michael Passman, a CPS spokesman. " Concerned that families would pull their children from school to participate in the rally, Chicago Public Schools Chief Education Officer Janice Jackson sent a memo to schools across the district urging them to alert their students' parents that absences related to the protest would be marked unexcused. "We commend students and families for supporting the issues they believe in, but hope that all parents will choose to send their children to school tomorrow so that they can continue receiving the education that will prepare them to become our country's next generation of leaders," read the memo distributed Wednesday. It is against federal law for a school district to check a student's immigration or citizenship status. As part of a sanctuary city, CPS does not let ICE agents access schools or student information without a verified criminal warrant or court order, the district said. Students are also not required to disclose their citizenship or immigration status. The district provides counseling for students working through the complex emotions that come with concerns about family deportation. It also arranges annual meetings for families that detail their rights and available resources. But it's difficult for students to grapple with such issues, the Reilly teacher said. "In my opinion, this is too heavy a weight for your average elementary school student to carry with him or her every day," he said. "Their parents are worried, and because of this, students are, for the most part, concerned, worried and fearful about the current immigration status. And in some cases, it has made it harder for them to concentrate in the classroom." "They shouldn't have to go through this," he added. "It isn't right." There have been other "significant" drops in attendance at CPS over the past year, although not always due to politics. The day after Trump was elected, district attendance fell to 90 percent, a 4 percent drop over last year's figures that amounts to roughly 15,200 students staying home. Attendance also fell below average on school days during the World Series and after a last-minute union deal that averted a teachers strike in October.